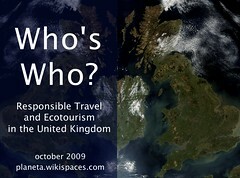 Planeta.com announces the development of a who's who working toward responsible travel and ecotourism in the United Kingdom. "We would like to see who's doing what in the world of ecotourism and responsible travel," said Planeta.com founder Ron Mader. A wiki has been created in which editors are updating information in a collaborative fashion. The project has received generous editorial assistance from Gerhard Buttner and Richard Hammond and comments from a half dozen others. "A project of this sort demands local contribution," Mader said. The Who's Who includes organizations, research centers, publishers and a special feature on City Environments. Among the institutions profiled: Bradt Travel Guides, Ecoescape, Forum for the Future, GreenTraveller, Wanderlust, Fringe Travel, Leaplocal, Maketravelfair, Travelmole, Your Safe Planet, the International Centre for Responsible Tourism, Hidden Britain South East, Overseas Development Institute, Responsibletravel.com and Tourism Concern. The complete directory is updated via the Planeta Wiki with links to the primary website and Web 2.0 channels. "We have worked with many of these players before," said Mader, "but until we crafted this index, we didn't see grasp the depth and breadth of the work of these actors. Hopefully, it will shed light on the participants themselves, who may not be aware of who's working next door." Any UK-based organisation, group or website which actively promotes, researches, or networks and offers space for exchange of ideas on topics related to responsible tourism, ecotourism, sustainable travel, ethical travel and green travel.